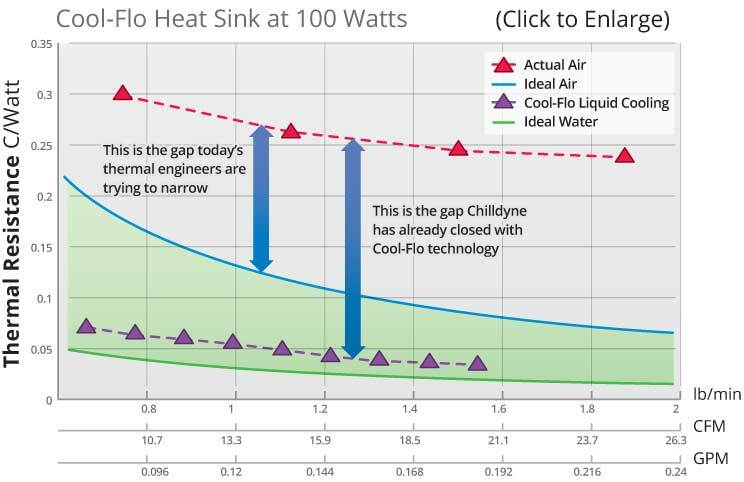 Today, thermal engineers are working to close the gap between the current air-cooled heat sink technology and the theoretical ideal air–cooled heat sink. At Chilldyne, we have already closed this gap and much more. Because our liquid cooling technology is significantly more efficient than air, our focus is on lowering the cost of the overall system. Because the Cool-Flo system operates under negative pressure, the system does not require expensive, pressure-tested connections. The Cool-Flo system utilizes low cost silicone/urethane tubing and low-tech connections, minimizing cost for high volume use. Chilldyne’s patented pistonless pump contains no moving parts, reducing maintenance costs. The modified, finned heat sinks act as a free “rear-door heat exchanger” for the rest of the data center, so the entire server gains the benefit of ancillary cooling of components even though they are not directly liquid cooled. The return on investment in Chilldyne’s Cool-Flo system will vary, depending on the current operating characteristics of the data center such as PUE and the cost of power. A 1-2 year payback on Cool-Flo System is possible.